This entry was first published on March 2, 2018. No earlier editions exist. counter-mapping: Mapping practices that set out to question, trouble, or contest dominant power relations in society through the act of mapping and/or the maps produced. critical cartography: A set of mapping and spatial visualization practices that begin from the acceptance that maps, like other socio-technical systems, are not and never can be neutral. Critical cartographic work accepts that maps are expressions of power and seeks to contest, critique, and subvert this power as it seeks to create (and critique) new ways of knowing, seeing, and being in the world. critical GIS: A term for research that brings social theoretical concerns into tension with geospatial information systems and science. Work in the area includes both critiques of the orthodox paradigms of GISciences as well as the conduct of geospatial analysis in pursuit of specific social and cultural goals. deconstruction: A methodology for revealing the underlying normative assumptions that are built into a text by the powerful. It does so through a focus on the margins of a text, what is and is not included within it. hermeneutic phenomenology: A branch of philosophy concerned with the situated nature of human experience in the world, that takes interpretation as a fundamental, integral act of being. ontogenetic: Something that is in the process of continually being brought and rebrought into existence. surveillant: An act of top-down recording of activity by organizations or those in power. sousveillant: Using technology to mirror, record, and confront those in power from a bottom-up perspective. technicity: The power of technology to act in and affect the world. transduction: A constant process of making and remaking. Maps, regardless of how one theoretically understands them or methodologically constructs them, make claims upon the world. These claims, expressed through what is included or excluded from a map and how those choices are represented in the mapping process, enable and constrain what can be known about the spaces and places a map depicts. As such, maps are intrinsically and inextricably expressions of power. As a means of situating the dialectical approaches to deconstructing and reconstructing maps that follows, this entry first provides two historical examples of the entanglements of cartography and cartographers with expressions of power. Specifically, it first discusses how cartography and mapmaking can be seen as intrinsic to the very formation of the modern nation-state and its citizens, focusing particularly upon colonial expressions of power, and then depicts the role the military-industrial complex within the United States played in the very formation of certain forms of analytic cartography (and GIS). The specific techniques, methods, and approaches to mapmaking and reading emerged in different places at different times (Pickles, 2004, p. 92), with the Babylonian Imago Mundi serving as generally agreed upon oldest example; however, Wood (2010, p. 22) has argued that – in terms of how modern cartographers understand and practice their craft – “there were no maps before 1500”. This provocative (and contestable) statement signals how the modern craft of mapmaking and interpretation is bound up in the establishment and performance of the modern state. Following Thongchai’s account of colonial mapping practices in the emerging Thai state (1994), Anderson (1991, p. 173) writes how maps “worked on the basis of a totalizing classification” (Anderson draws from the earlier dissertation version of Thongchai’s work, see page xiv). More recently, the practice of analytical cartography and its influence upon GIS demonstrate the continuing ties between expressions of state power and cartographic praxis. Clark and Cloud (2000) depict how early work on automating and computational systems for geographic information processing were created during the Cold War for the United States military. Similarly, Monmonier (2002) demonstrates how many of the core technological apparatuses used for mapmaking have their roots in military applications. To this day, “the most effective mapping and imagery, in terms of coverage, scale, positional accuracy and currency, has been, and often still is, the exclusive preserve of the military” (Perkins and Dodge, 2009, p. 547). These examples are meant only to illustrate the ongoing relations between state power and cartography and to better situate the following approaches within the over-arching structure of cartographic practice, history, and technology; the reader is encouraged to see the Additional Resources for more detailed engagements with the history of cartography and power as the entry now turns to a series of heuristic dialectical approaches to the power of maps and map making. Writing in the late 1980s, for Brian Harley, maps were always social constructs, cultural texts, suffused with power “[b]oth in the selectivity of their content and in their signs and styles of representation” (Harley, 1988, in Wood, 1992, p. 78). Challenging the established paradigm of maps as a communicative system (see, inter-alia, Robinson & Petchenik, 1977; Robinson et al., 1995), Harley drew explicitly from post-modern theorists Jacques Derrida and Michel Foucault, as well as Wood and Fels’ (1986) work using Roland Barthes, to suggest maps be seen as always constructed within a field of power relations. Maps, in this view, both enable and suppress knowledge through the intentional and unintentional elements of the ideological practice of cartography. Harley referred to the suppression of knowledge within maps as “silences which arise from deliberate policies of secrecy and censorship” (Harley, 1988, p. 57). Maps are “practices and relations of power-knowledge” (Crampton, 2001, p. 241) and can be deconstructed alongside other socially constructed, rhetorical texts. The power of maps, in a deconstructivist view, can be found in two registers. First, there is the power exercised by the cartographer through the map production process. Second, there are the roles that maps play within elite discourses of society and in processes of colonization and accumulation by dispossession. The deconstructivist approach to understanding the power of maps has proven a productive one for critical cartographers, allowing a “tack” between discourse analysis of maps and their epistemological framings and the historical, cultural, socio-economic, and political situatedness that led to their production (Elwood, 2015). Interactive, digital, personal maps and the everyday practices through which they are produced and of which they mediate are no longer so easily considered the cold, dead artifacts of the elite that Harley called cartographers to critique. But, GIScientists must continue to seek out “those ‘aporias,’ blindspots or moments of self-contradiction” in any map they create or encounter (Norris in Harley, 1989, p. 8). While there were and remain notable disagreements within approaches to deconstructing the map as text, a related group of scholars approached the power of cartography through the lens of hermeneutic phenomenology. Often associated with the work of Martin Heidegger, hermeneutic phenomenology views consciousness as intrinsically linked to historically situated lived experience and places interpretation as a fundamental act of being human (Laverty, 2003). In critiques of cartography and geography more broadly, hermeneutic phenomenology has served as a method for questioning theories of truth and representation. This approach extends from Harleyian concepts of deconstruction – on the limits of a text to reveal its underlying power dynamics - but is also informed by the debates of the early 1990s around the use of GIS (see, inter-alia, Taylor, 1990; Openshaw, 1991; Smith, 1992; Lake, 1993). Rather than seeing the terms as a complete embracing of logical positivism and absolute truth or a full rejection of GIScience, this work attempted to “develop a thorough-going ideological critique of the role and place of technology and social engineering in society” (Crampton & Wilson, 2015, p. 33). Influenced by the work of Heidegger on technology and drawing directly from Virilio, Benjamin, and others, Pickles (1995, p. 231) writes of mapping techniques as “extend[ing] a rationalistic logic – a universal calculus – to unify space as object, material, and fundament”. Historically, the influence of this particular approach can be seen in the original Friday Harbor meetings, the subsequent Initiative 19, the Varenius project, and in collected volumes like Ground Truth (See Additional Resources for a chart that places these projects temporally and in relation to other research). More recently, the legacy was revisited at a second Friday Harbor meeting (Thatcher et al., 2016a). The specific focus on interpretation, on the situatedness of all truth claims, marks it as distinct from pure deconstruction. The goal is not solely to deconstruct the map, but rather to interpret its meaning and, in so doing, to open avenues towards producing alternative representations and potentially alternative frameworks for understanding and being in the world (Pickles, 2004). A common theme in both deconstructive and phenomenological approaches to understanding the power of maps is an engagement with the ways in which cartography and mapping has and continues to be enrolled in technoscientific, modernist, and colonial discourses. These critiques note that the power of maps tends to flow from the powerful to those less so as means of ordering and control. This can be seen to occur on two levels: first, in the technocracy around which maps are constructed and produced and, second, in the ways that maps instantiate specific views of the world as austere, absolute, and correct. Obermeyer (1995) saw the foundations of a growing “hidden technocracy” in the emerging computer-based systems of map design and production. Although focused specifically on GISystems, Obermeyer’s critique draws upon a long history of concern with access to and representation within the technocratic structures of society; noting parallels between the scientific management of Taylorism and GIS employment’s emphasis on education and technical ability. For Harley, drawing on Foucault, this was the “internal power” cartographers practiced in the design and production of maps (see Rose-Redwood, 2015, p. 4). Against such approaches and critiques of the top-down power of cartography, researchers and practitioners have engaged in more participatory and sousveillant (“bottom-up”) approaches to maps and mapping in a number of ways (see Participatory Mapping). While impossible to cover the variety of methods and epistemologies involved in participatory, public, and critical cartographic projects here, of particular interest are expeditionary approaches to mapping and critiques thereof, qualitative approaches to GIScience, and the sousveillant and resistive acts taken with mobile spatial devices (see Mobile Mapping & Responsive Design, forthcoming). First, the expeditionary approach to mapping is perhaps most strongly associated with Bill Bunge and the Detroit Geographical Expeditions and Institutes which ran through the late 1960s and early 1970s (e.g. Bunge, 1971). John Pickles (in Crampton & Wilson, 2015, p. 33) summarizes this approach as “I can bring a technology, but you have the questions, you bring the information, and we’ll work together.” This approach can be read as “doubly radical” in its idea that not only could non-dominant power structures be made legible through mapping, but that the members of the communities in question must not only be subject, but also author, of the mapping projects (Thatcher, 2017). See Additional Resources for Warren and Katz (2014)’s discussion of the legacy of this approach. Third, alongside the advent of spatially-aware mobile devices and their use in the creation and appropriation of spatial data about daily life has emerged a growing practice of subverting previously surveillant systems into sousveillant ones. Coined by Mann et al. (2003), sousveillance is the act of using technologies to monitor those with institutional power and contest their (spatial) orderings of the world. When combined with spatial data, sousveillant practices include counter-cartographic practices like the Anti Eviction Mapping project which identifies and puts a name to those individuals who are driving eviction and gentrification processes in San Francisco. Finally, it is critical to note that participation by a larger community in the process of map design and distribution does not inherently produce a cartographic critique of dominant power structures within society (Elwood, 2006). There is a great distance between the Bowman Expeditions appropriation of participation to further state and military goals (Wainwright, 2013; see also Additional Resources for information on the Bowman Expeditions and related controversies) and the autonomous cartographic efforts of the Counter Cartographies Collective to subvert similar goals on the campus of University of North Carolina Chapel Hill (Counter Cartographies Collective et al., 2012). Counter-mapping, as a term, was coined by Nancy Peluso (1995) to describe the methods by which indigenous activists were using maps to attempt to re-claim land access and use rights that were not represented in official state maps. Further, many of these approaches to more ‘bottom-up’ mappings draw from diverse sets of theoretical and empirical commitments that can result in fascinating repetitions of similar visualizations across time and space. 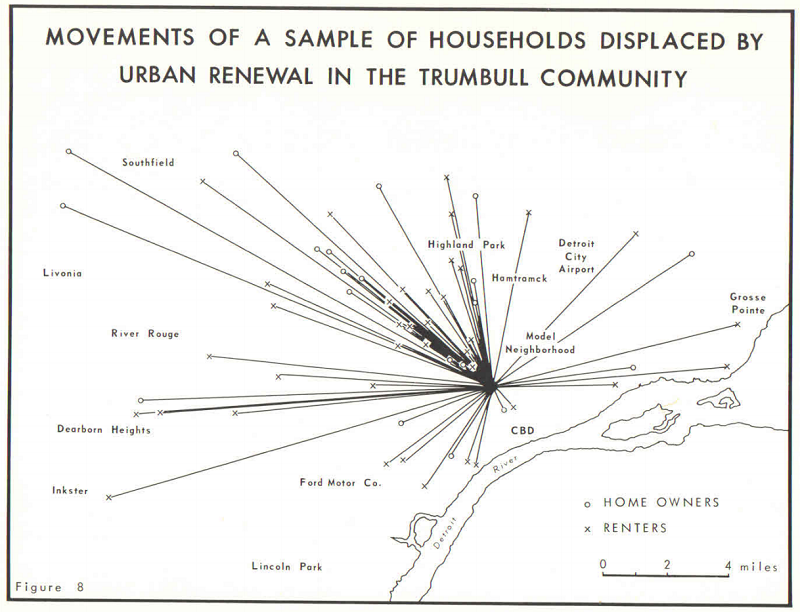 Where the Bostonography project uses new web-mapping technology to purposefully echo Kevin Lynch’s cognitive mapping projects (Woodruff and Wallace, 2010; Lynch, 1960), the visual similarities between the Anti Eviction Mapping Project’s relocation map and the similar one produced by the fourth Detroit Geographical Expedition for the Trumbull neighborhood are less intentional (Figures 1 and 2). Similar sets of concerns arise over time as cartographers and GIScientists have attempted to engage with the limits of both society and mapping; in so doing, it is necessary to retain a care for maps and mapping that allows critique to tackle “enframing assumptions while remaining invested in the subject” (Schuurman & Pratt, 2002, p. 291). Figure 1. 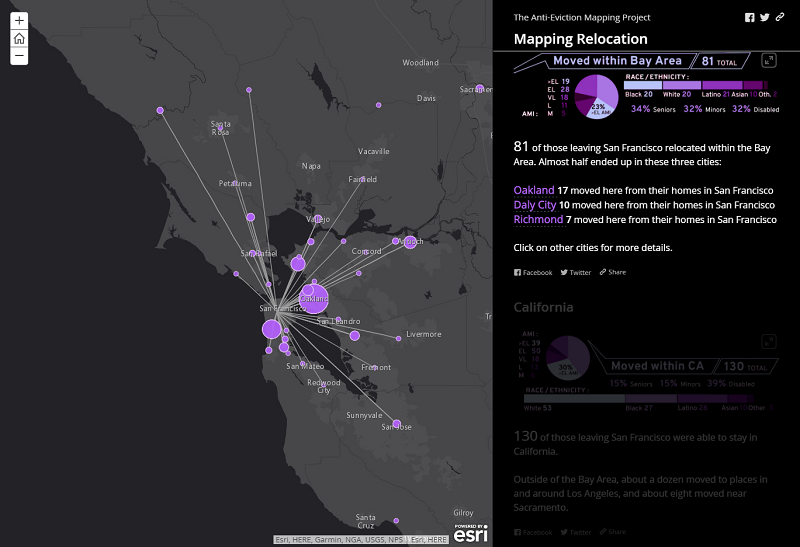 A map of where individuals have relocated when evicted from San Francisco. Map available at the Anti-Eviction Mapping Project. Source: Used with permission from the author. Figure 2. A map from the fourth DGEI that depicts where displaced households have moved within the Detroit metro region. FromThe Detroit Geographical Expedition and Institute Then and Now: Commentaries on “Field Notes No.4: The Trumbull Community.” Source: Map available from the Antipode Foundation's DGEI Field Notes. Used with permission of the author. Alongside the view of maps as presenting views from above or below has come a more recent focus on maps as post-representational. In such ontogenetic approaches, maps are never ontologically secure, stable objects, but are rather constantly coming into being as they are created and recreated by multiple actors. Such views re-center the power of maps from what the map ‘is,’ or perhaps appears to be, towards a focus on mapping practices – those myriad acts that both bring maps and their interpretations into being. Such approaches often go “beyond the map” in order to focus on the ethnographic, embodied practices that go into both map production and interpretation rather than more textual ‘readings’ of existing maps as objects (Dodge & Perkins, 2015, p. 38). By focusing on the coming into being of maps, ontogenetic approaches call attention to the shifting assemblages that increasingly go into the production and experience of maps. On one level, a focus on maps as ontogenetic allows for a greater consideration of how spatial technologies increasingly transduce space and spatial relations (Dodge & Kitchin, 2005). In this view, it is the technicity of software, of mapping platforms, through which the power of maps functions (Kitchin & Dodge, 2007). On another level, these same assemblages of spatial data and visualization produce immensely personal maps used by individuals in their daily lives. By destabilizing the map as an object and focusing on the coming into being of the map in daily use, ontogenetic approaches allow for a greater understanding of the joyful practices of everyday life. The act of both map creation and map interpretation is resituated as a deeply personal, contingent, and social practice (Brown & Lauerier, 2006). Figure 3. 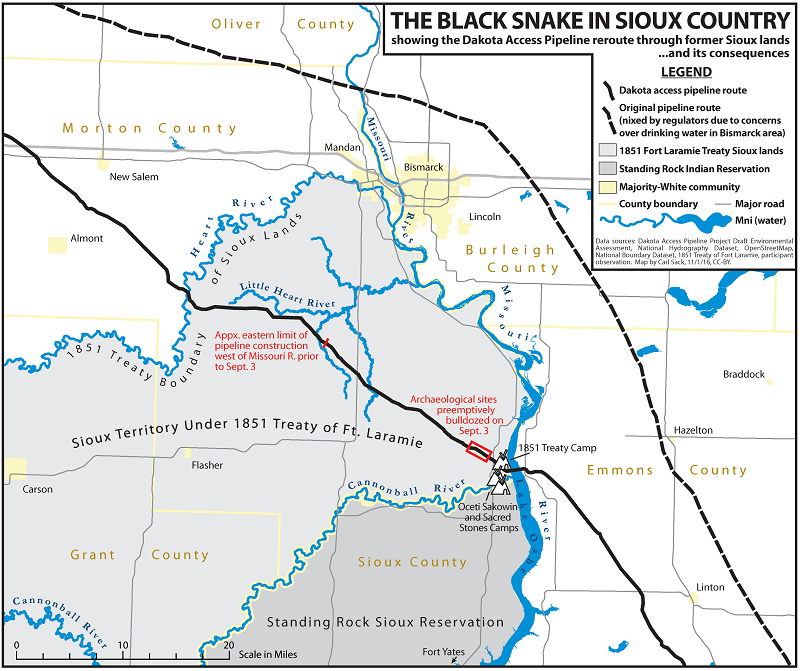 Carl Sack's popular depiction of where the Dakota Access Pipeline and Sioux lands interact. Source: Carl Sack. Used with permission of the author. Other entries in the Body of Knowledge cover some of this material. For example, for a discussion of Cartography’s function as art, see the Cartography and Art entry; for additional reading on power and praxis, see Epistemological Critiques. The Additional Resources listed below attempt to provide further guidance, including a chart of critical cartography and GIS meetings and projects. However, in its own silences and gaps this entry can be "deconstructed" alongside any other text or map and readers are encouraged to turn a critical, reflexive eye both to this piece and to the maps they encounter and produce. The production and experience of maps is an embodied, often joyful experience, but it is one laden with power. The recent and ongoing advent of new mapping technologies and new sources for spatial information mean there are likely more maps being made by more people than ever before. Maps are back, but it is integral to consider what kinds (O’Sullivan et al., 2017). There is a “surprising historical continuity” in the roles maps play in society (Pickles, 2004, p. 12) with more maps used to exploit, control, and outright kill than ever before (Bryan & Wood, 2015; Gregory, 2010). To understand the relations between cartography and power is not simply an exercise in knowledge, but requires a continued engagement in the praxis of making maps which call into question the dominant paradigms of power and exploitation and how those paradigms are instantiated through maps and map making. Anderson, B. (1991). Imagined Communities (Second Edition). London, UK: Verso. Bryan, J., & Wood, D. (2015). Weaponizing Maps. New York: Guilford. Bunge, W. W. (1971). Fitzgerald: Geography of a Revolution. Cambridge, MA: Schenkman Press. Cope, M., & Elwood, S. (2009). Qualitative GIS: A Mixed Methods Approach. London: Sage. Couclelis, H. (1988). The truth seekers: geographers in search of the human world. In R.G. Golledge, H. Couclelis, and P. Gould (Eds. ), A Ground for Common Search (pp. 148-155). Santa Barbara: Santa Barbara Geographical Press. Counter Cartographies Collective, Dalton, C., & Mason-Deese, L. (2012). Counter (Mapping) Actions: Mapping as Militant Research. ACME, 11(3), 439-366. Haraway, D. (1988). Situated Knowledges: The Science Question in Feminism and the Privileges of Partial Perspetive. Feminist Studies, 14(3), 575-599. Haraway, D. (1991). Simians, cyborgs and women: the reinvention of nature. New York: Routledge. Harley, J. B. (1988). Silences and Secrecy: the Hidden Agenda of Cartography in Early Modern Europe. Imago Mundi, 40, 57-76. Harley, J. B. (1989). Deconstructing the Map. Cartographica 26(2), 1-20. Lacoste, Y. (1973). An Illustration of Geographical Warfare: Bombing of the Dikes on the Red River, North Vietnam. Antipode, 5, 1-13. Lynch, K. (1960). The Image of the City. Cambridge, MA: Harvard University Press. Monmonier, M. (2002). Spying with maps: Surveillance technologies and the future of private. Chicago: University of Chicago Press. Pavlovskaya, M. (2009). Feminist Visualization. In R. Kitchin, and N. Thrift (Eds. ), International Encyclopedia of Human Geography (pp. 157-164). Amsterdam: Elsevier. Perkins, C. (2007). “Mapping.” In I. Douglas, R. Huggett, and C. Perkins (Eds. ), Companion Encyclopedia of Geography: From Local to Global (Second Edition) (pp. 553-570). London: Routledge. Pickles, J. (Ed.) (1995). Ground Truth. New York: Guilford Press. Pickles, J. (2004). A History of Spaces. New York: Routledge. Robinson, A., & Petchenik, B.B. (1976). The Nature of Maps: Essays towards Understanding Maps and Mapping. Chicago: University of Chicago Press. Robinson, A., Morrison, J., Muehrcke, P., Kimerling, A. J., & Guptill, S. (1995). Elements of Cartography, 6th Edition. New York: Wiley. Rose-Redwood, R. (2015). Introduction: The Limits to Deconstructing the Map. Cartographica, 50(1), 1-8. Schuurman, N. (2000). Critical GIS: theorizing an emerging discipline. Cartographica, Monograph 53. Taylor, P. (1990). Editorial Comment: GKS. Political Geography Quarterly, 9(3), 211-212. Thonchai, W. (1994). Siam Mapped: A History of the Geo-Body of a Nation. Honolulu: University of Hawaii Press. Toscano, A., & Kinkle, J. (2015). Cartographies of the Absolute: An aesthetics of the economy for the twenty-first century. Winchester: Zero Books. Wainwright, J. (2013). Geopiracy: Oaxaca, Militant Empiricism, and Geographical Thought. New York: Palgrave Macmillan. Wood, D. (2010). Rethinking the Power of Maps. New York: Guilford. Wood, D., & Fels, J. (1986). Designs on Signs: Myth and Meaning in Maps. Cartographica, 23(3), 54-103. Describe how all maps are produced within relations of power and knowledge. Describe how all maps also express specific relations of power and knowledge. Identify and critique a map using one of the approaches to understanding the power of maps from the entry. Identify and critique a map created through surveillant approaches to map making. Identify and critique a map created through sousveillant or participatory approaches. Identify how different methods of data classification for a single dataset can produce different visualizations that will influence users differently. Deconstruct a map of an area you know well to find silences, blindspots, and moments of contradiction that reveal larger power structures . Create two visualizations of the same area – one meant to be used for advertising in a tourist brochure and one meant to analyze public health and safety concerns. Find (or create) two visualizations of the same area – one meant for use by tourists and one created by a public advocacy group (such as a public safety map). What constraints have shaped each visualization, how did the authors wield their power? Consider what was chosen for inclusion and exclusion in each map. How has map production and interpretation changed in light of critical cartography and GIScience? How can you go about your map making praxis in a more reflexive, inclusive manner? How can you interpret and critique maps in a way that better illustrates their blind spots and the knowledges and powers that influenced their creation and interpretation? How is a map alive with possibilities to be remade and reinterpreted? How might it not be? In other words, what are the limits of interpretation of a given map? Does the medium influence how you view the map (an interactive versus paper map, for example)? If applicable, what are some participatory mapping experiences you have encountered or contributed to? How did they differ from other mapping projects? What were the internal power dynamics of these participatory projects? Whose power and influence are manifest in the map, whose is excluded? If you have not, consider the case of Open Street Map (http://openstreetmap.org). Looking at it, how is it different than Google Maps – both in terms of what data it shows as well as in how you interact with it? What is missing from this data set? What questions can I not ask this data? Why am I choosing the classifications schema that I have? What alternatives might be taken? How will the colors and labels I have chosen influence what the user interprets from the map? Why have I chosen to include/exclude the material I have? Where have I set the limits of knowledge for the user and why have I done so? How would you deconstruct the power relations inherent in Figure 3? Was it created through a participatory or surveillant methodology? Bryan, J. & Wood, D. (2015). Weaponizing Maps. New York: Guilford. Crampton, J. W. (2010). Mapping: A Critical Introduction to Cartography and GIS. Wiley-Blackwell. Denil, M. (2011). The Search for Radical Cartography. Cartographic Perspectives, 68, 7-28. Dodge, M., Kitchin, R., & Perkins, C. (2009). Rethinking Maps. London: Routledge. Dodge, M., Perkins, C., & Kitchin, R. (2009). Mapping modes, methods and moments: A manifesto for map studies. In M. Dodge, R. Kitchin, and C. Perkins (Eds. ), Rethinking Maps: New Frontiers in Cartographic Theory. Abingdon: Routledge. Goodchild, M. F., Egenhofer, M. J., Kemp, K. K., Mark, D.M., & Sheppard, E. (1999). Introduction to the Varenius Project. International Journal of Geographical Information Science, 13(8), 731-745. Harris, L. & Harrower, M. (eds.). (2006). Special Issue: Critical Cartographies. ACME: An International Journal for Critical Geographies, 4(1). O’Sullivan, D. (2006). Geographical Information Science: Critical GIS. Progress in Human Geography, 30(6), 783-791. Schuurman, N. (2000). Trouble in the heartland: GIS and its critics in the 1990s. Progress in Human Geography, 24(4), 569-590. Schuurman, N., & Kwan, M-P. (2004). Guest editorial: Taking a Walk on the Social Side of GIS. Cartographica, 39(1), 1-3. Sheppard, E. (1995). GIS and Society: Towards a Research Agenda. Cartography and Geographic Information Systems, 22(1), 5-16. Perkins, C. 2002/2003/2004. Series of three progress reports on Cartography. Progress in Human Geography 26(4)/27(3)/28(3). Rose-Redwood, R. (ed.). (2015). Special Issue: ‘Deconstructing the Map’: 25 Years On. Cartographica, 50(1). Thatcher, J. L., Bergmann, D., O’Sullivan, B., Ricker, R., Rose-Redwood, T., Barnes, L., ... & Wilson M. W. (2016). Revisiting Critical GIS: Reflections from Friday Harbor. Environment and Planning A, 48, 815-824. Wilson, M. W. (2017). New Lines. Minnesota: University of Minnesota Press. In addition to the Resources listed here, the reader is encouraged to consider some of the projects and meetings that have attempted to deal with Cartography, GIS, and Power over the years. This chart is not definitive, but suggests an ongoing history of endeavors related to cartography and power. Detroit Geographical Expeditions (1969 – 1972 or later) Map topics set by community; maps made by community Other expeditions (Vancouver, etc. ), expeditionary method, Fitzgerald, DGEI Field Notes.